I get asked all the time about how to prepare pot roast. How I do it is pretty simple. Sometimes I add different herbs, but salt and pepper are really all you need. Additionally, you can cook potatoes in the pot with the roast, but I prefer to serve roast with mashed potatoes. 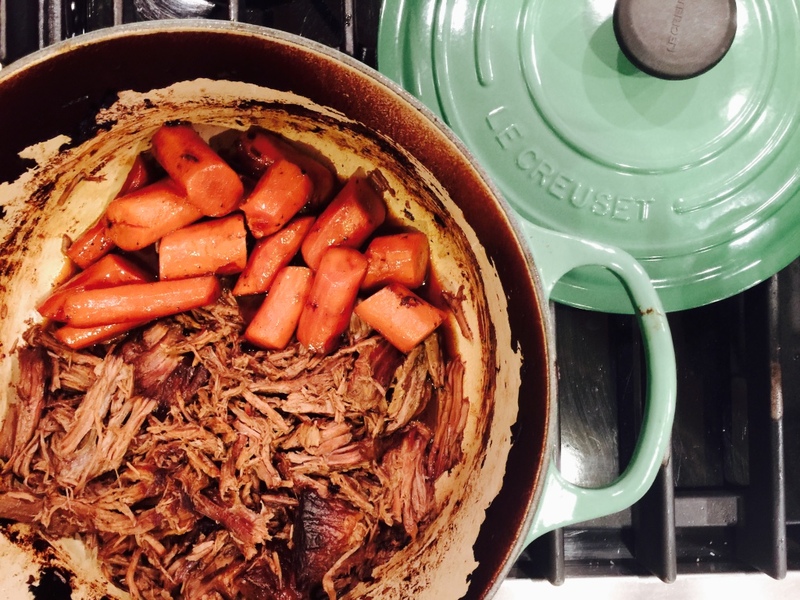 Follow these 3 steps, and you’ll get a perfect pot roast every time. 1) Choose the right cut of beef. Expensive is not better, so save the tenderloin for another day. Rump Roast is the best cut for pot roast. Chuck Roast is good as well, but I generally find it to be too fatty. 2) Brown the beef. In a Dutch oven, brown the roast on both sides on the stove. Take a little extra time to ensure there is a good crust on the beef. 3) Cook the roast slowly and covered (and don’t use the slow cooker). I’m sorry to say that while I love my slow cooker, it just won’t give you the kind of roast you want. You need a Dutch oven with a tight fitting lid. If you MUST use your slow cooker, don’t skip the browning step. Preheat oven to 275º. Sprinkle the roast generously with salt and pepper. Heat a large Dutch oven over medium-high heat and add olive oil. Cut onion in half (you want to remove it later) and cut carrots into big chunks. Place the meat in the pan and sear it for about a couple of minutes on all sides until it is nice and brown all over. Remove the roast to a plate. With the burner still on medium high, use beef broth (about 1 cup) to deglaze the pan (pour in the broth and scrape the bottom of the pan with a wooden spoon to get all the little bits of browned beef off the bottom). Place the roast back into the pan and add enough beef stock to cover the meat halfway. Add in the onion and the carrots to the pot. Put the lid on, then roast the beef at 275 for 3-4 hours (or longer). Check the roast after 3 hours and add additional broth if necessary. Serve with mashed potatoes. 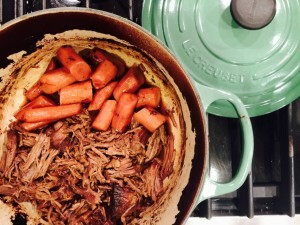 Copyright © 2015 Our Everyday Dinners - This is an easy recipe for how to make Pot Roast.